A collective of women artists inside of the beloved boutiqur Rainbow's End, in historic downtown Flagstaff. Voices from within the collective. Wondering where the Indigo Art Collective came from? Excited for the artistic possibilities that will undoubtedly come from our union? We are the Indigo Art Collective and this is our story. In March of 2015 the Indigo Art Market was founded by one of our soul sisters, myself, Kayley Quick. I set up the market with the intension of creating a community space where artists/artisans of all levels could connect and gain confidence selling their unique crafts and talents. We held the market at The Green Room for a couple of years on First Friday’s. We were grateful for this large space and the opportunities provided to us by The Green Room. As time passed, we began to explore more events and festivals. In 2016 we created our first space at Flagstaff Hullabaloo. We were very excited to branch out and try something new. In this space, we facilitated community classes such as ceramics and spinning yarn on a wheel. Additionally, we had a giant community coloring board. All the classes and the community color board were a big hit. This encouraged us to continue growing and pursuing our dreams of creation. Over the years, we began gaining a close friendship. We loved supporting one another and encouraging each other to take the next steps for our individual businesses. We find passion in each other’s work and are continually impressed by the levels of craftsmanship and dedication our fellow sisters possess. Finally, in 2018 we took a giant leap and created a business downtown. In this business, we host a monthly exhibit on #theindigowall, classes, studio space and a retail space. We are very proud of our accomplishment and can’t wait to see what the future holds for us. To learn more about our classes, visit our classes section of our website. Additionally, you may always call 928-377-5781 or email indigoartmarket@gmail.com to speak with us personally. Indigo Art Collective is a Flagstaff, Arizona based artist collective. Home of the Indigo Art Market. A local artisan market of Flagstaff artists and makers, sharing creations of heart. 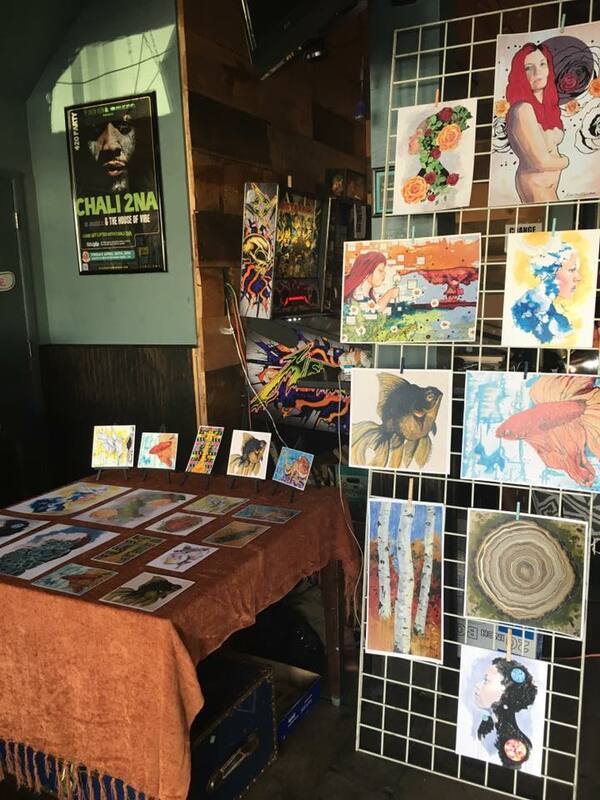 We bring art to the community with demonstrations and interactions, connecting people to creativity while giving people the opportunity to purchase unique, handmade items. We are located just inside Rainbow's End to the right, against the pink wall and front windows.